As you shop the online catalogs of refineries and mints, you’d be forgiven for eventually confusing one product for another. So many minted ingots today are produced in great volume with little differentiation in design. Atlantis Mint cuts through the boredom with exciting and unique hand-poured designs. Silver.com now offers the 5 oz Silver Atlantis Mint Hand Poured Skull Bar for purchase online. Brand-new product available from the Atlantis Mint! Arrives in a protective plastic sleeve. Bears a 3D form, bringing the skull to life. Obverse features the image of a human skull. Reverse bears only identifying engravings. Hand-poured and hand-stamped by Atlantis Mint. Produced at a private facility in the USA. The human skull is generally considered to consist of twenty-two bones, some of which are visible in detail on the 5 oz Silver Atlantis Mint Hand Poured Skull Bar. For example, the skull consists of two nasal conchae, two nasal bones, and the large mandible bone that makes up the human jawline. Each of these common features are visible on this bar. 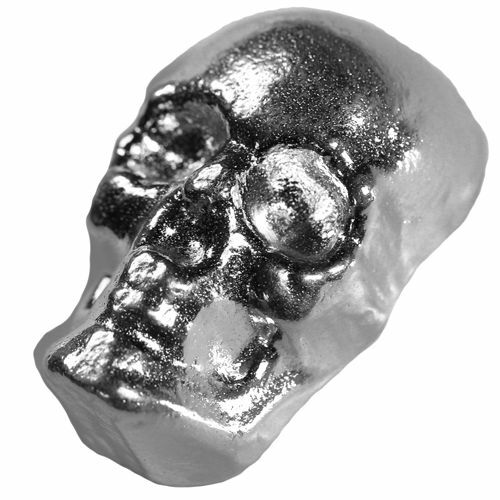 On the obverse of the 5 oz Silver Atlantis Mint Hand Poured Skull Bar is the 3D impressive of a human skull. The design is a haunting one that features a smiling mouth full of teeth, a strong jaw bone, hollow nasal cavities, and vacant eye sockets. There are no engravings on this face. 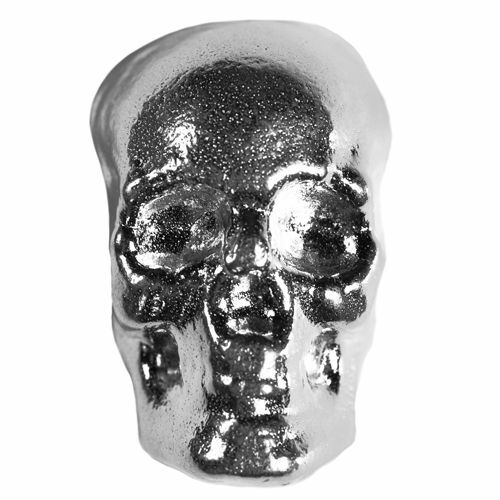 The reverse of the Atlantis Mint Hand Poured Skull Bar features a flat surface and mirrored finish. The only engravings on this bar are found on this side, and include the bar’s weight and metal purity. The 5 oz Silver Atlantis Mint Hand Poured Skull Bar is one of three new bars in this lineup, which also includes a smaller one ounce and two ounce option. 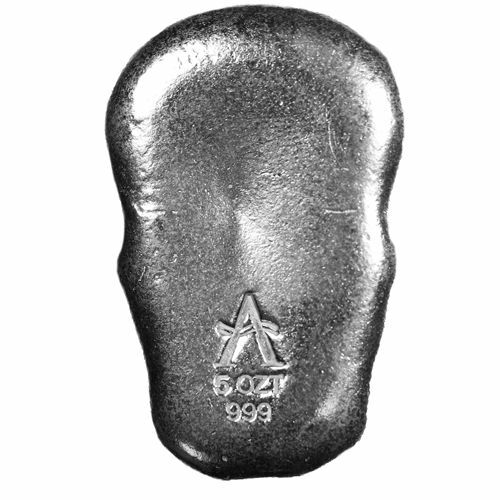 The Atlantis Mint is well known for its hand-poured, 3D bar designs. Atlantis Mint is a family-owned mint located in the United States. All of its products are hand-poured and hand-stamped for a unique look and feel to each piece. It deals strictly in silver for its own products, allowing it to alter prices on the spot as the price of silver changes in the market. If you have questions, don’t hesitate to ask. Silver.com associates are available at 888-989-7223, online using our live web chat, and via our email address. To see similar products, check out our full selection of Atlantis Mint Silver Bars.